Having a positive culture in your workplace can play a huge role in the well-being of your employees and the quality of the work they do. When designing a wellness program, a lot of times just doing a screening or Health Risk Assessment isn’t enough to make an impact. If you really want to help your employees live healthier lifestyles, you’ll need to create an environment conducive to those choices. While there isn’t one single way to develop this healthy culture, there are some strategies that can help. Check out these seven steps you can take to strive towards a healthier workplace. It’s important to get feedback from your employees. Ask what they want out of a wellness program, and really listen to the answers. That will not only help you to create a program they’ll want to be a part of, but it gets rid of some of the guesswork and planning steps you have to take. Check out the full guide for some help with creating surveys to get employee feedback. Put together a strategy that addresses the things you heard when you were listening. Find out what interventions and programs will help your employees reach their goals. Consider partnerships within your community, team challenges, sponsorships or awareness building events. Our full guide has a bunch of other great, creative ideas. The possibilities are endless to develop a fun, meaningful wellness program. There are many ways to communicate with your employees. Learn which ones work best for your company. That can include posters, emails, videos, newsletters, physical memos, social media and so much more. 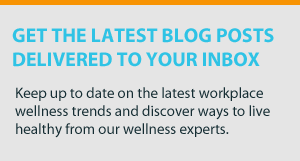 In our full guide, check out the seven key phrases to use when communicating wellness to your employees. Physical activity is a huge factor in overall health. Most Americans spend a majority of their time at work. Unfortunately, this worktime is often spent sitting at a desk, which can greatly increase health risks. Encourage daily walking, develop an active design in your workplace, create policies to promote activity, and even encourage activity outside the walls of your office. Competition can be an excellent source of improvement in any area of business—especially wellness! Create healthy competition by hopping on the “gamification” bandwagon. Depending on the goals of your program, you can set up customized challenges, events and more. Extend these challenges beyond physical activity to include healthy recipe cook-offs, gratitude contests and better beverage challenges. Check out our full guide for some excellent examples from real companies around the country. Encourage your employees to encourage one another. Seek out “wellness champions” as internal leadership in your program. Use incentives sparingly to allow employees to develop an internal motivation. Most importantly, stay positive throughout the process. Not only is positive messaging encouraging and uplifting, but it can have some serious health benefits too. Stress is not good for your health. A wellness program shouldn’t add any extra stress on your employees. Make your program fun by sponsoring interesting events, and rewarding and recognizing your participants’ successes. Again, think outside of physical goals. Offer cooking classes, get company water bottles or celebrate someone’s new stress-relief practices. Make your employees WANT to make healthy choices. In the end, most of what you do at the workplace is affected by the culture you’ve created. Corporate wellness is no different. 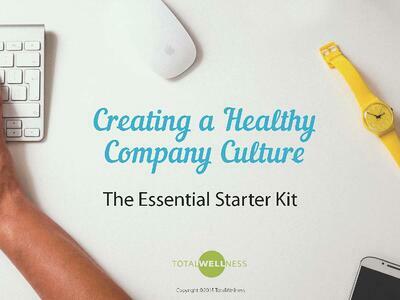 Be proactive by creating a healthy, positive company culture that will inspire your employees to be healthy. What elements of your company culture are conducive to employee wellness?